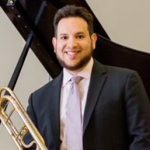 Joseph Muñoz is a trombonist from the city of San Diego, California. He received his Bachelor’s in Performance with Teacher Certification from the University of Michigan, Ann Arbor where he performed with the Symphony Band under Michael Haithcock, the University Philharmonic under Andrew George, and the Jazz Ensemble under Ellen Rowe. He studied classical performance practice with David Jackson and jazz improvisation and big band arranging with Dennis Wilson. He has coached with such artists as Ron Barron, Larry Zalkind, Eighth Blackbird, Michael Powell, John Rojak and Alex Illes. He has performed with artists such as Nnenna Freelon, Deborah Voigt, Steve Turre, Ray Mase and Phil Wilson. He has played under the baton of such conductors as Jerry Blackstone, James Conlon, Michael Stearn, Andre Boreyko, Lawrence Foster, Peter Oundjian and David Zinman. Joey has attended the Idyllwild Music Festival, the Hot Springs Music Festival, and the Aspen Music Festival. He has been the recipient of both the Aspen Chamber Symphony Fellowship performing Martin’s Concerto for Seven Winds and the American Academy of Conducting at Aspen Orchestra Fellowship. While there he studied under the tutelage of Per Brevig and Warren Deck. Joey completed his Masters with James Miller, Acting Principal of the LA Philharmonic, in 2011. He intends to complete his dissertation for his Doctor of Musical Arts degree by December 2013. While at UCLA, he played under the direction of Neal Stulberg, Patrick Sheridan, and Timothy Salzman. He has previously served for four seasons as the Principal Trombone of the Young Musician’s Foundation Debut Orchestra based in LA and participated in their international tour of China. Most recently, he substitute taught at the Northern Arizona University Curry Summer Music Camp under the camp direction of Elliot Tackitt. 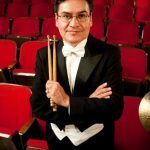 Joey is currently enjoying his professional career as a symphonic musician, a freelance musician, a private teacher and a substitute teacher for the Tucson Unified School District.